Valve Portal 2 is Out Now, and it’s Awesome!! GearGuyd > Cool > Valve Portal 2 is Out Now, and it’s Awesome!! Portal was originally included as part of Valve’s Half Life 2 Episode 2 Orange Box release, and it was a very clever and entertaining game. 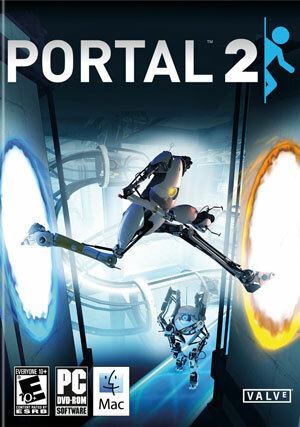 After Portal earned much acclaim since its 2007 release, Valve went to work on Portal 2, which was released yesterday. I don’t want to spoil the story for you, so I’ll be short – in Portal 2 you have a portal gun, and many puzzles to solve. In each level, you are tasked with getting from the starting point to the exit, some with many challenges in your way. Your portal gun lays down 2 doorways through which you transit from one point to another simultaneously. With a rating of E, Portal 2 is fun for everyone ages 10 and up, although younger players may require a peek at an online walkthrough or two. Portal 2 is available for PC, Mac, Xbox 360, and Playstation 3 platforms. If you’re hesitant to pay $45-$55 for the game, check out the free Portal 1 demo for a small taste of what Portal 2 offers. Not to mention that co-op mode is a real pleasure to play regardless of being on PC/Mac or X-Box 360/PS3. I personally like the fact that they still let you use the “point out” functions in splitscreen on the console versions as sometimes telling someone, “put the portal where I’ve marked,” is quicker than trying to describe exactly where to look (especially in those levels with big rooms and a lot of details). Also, the multi-player emotes are pretty funny. I agree about the multi-player part, but it’s a bit more of a challenge if you opt to play with a stranger as your partner. I have found that there are 3 types of anonymous partners – those that played everything already, those that are complete noobs, and those that will enable cheats that make everything crazy. The gestures are amusing, especially the show-off portable shooting and head-grabbing/spinning ones.